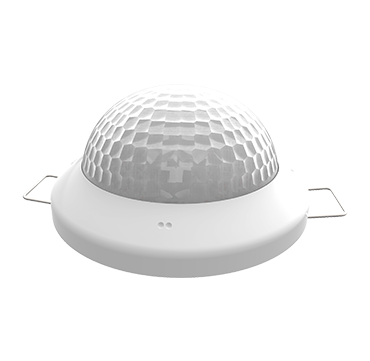 Presence detector with luminosity sensor for ceiling mounting, with a detection area of 360º and up to 30 meteres diameter. It includes several channels to be configured for constant luminiosity regulation, lighting switching control according to luminosity threshold or according to presence detection only. Sensitivity settings can be adjusted for each sensor individually and luminosity can be calibrated to the working environment values. Master/slave configuration allows using several detectors for larger areas. Flush mounted or surface mounted (accessory included).